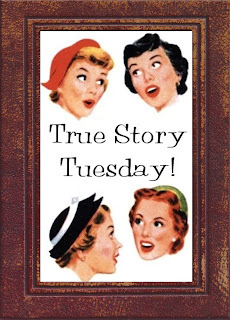 Time for True Story Tuesday y'all! Happen to remember that you wrote about that amazing story? Or the one outrageous tale that gets told 'round the Thanksgiving table every year? How about the one that is now family legend because it was so stinkin' hilarious? Link up! We'd love to hear your old or new story that just happens to be outrageous, amazing, miraculous, hilarious, and (mostly) true! Add your link and we'll send some comment love your way! Yep the gap in the teeth, reddish hair and freckles, a cow lick and yes indeed those stick me out ears that just begged to be teased about... (Lord I apologize) and the most incredible ability to get into the most boneheaded predicaments. On this night he was pounding out some anchor pins on a brake just before lunch, and smacked the back of his hand with a sledge hammer. He was jumping up and down and howling pretty good (kinda like it hurt or something). We got him all calmed down and everyone headed to the lunch room. Did I mention that every one had dove into their nose bags???? And after receiving a sore hand, and only minor bruising and swelling about the head and shoulders from the boss man, the Goat Roper survived to be the beneficiary of many more thoughtful and slightly less-than-lethal endeavors from his always kind and caring co-workers. The last I had heard, he was progressing quite nicely from his nervous breakdown. That is mostly hearsay as I haven't talked to any of the old crew for several years now. Whaddya waiting for? Got a tale of revenge to share? Some holiday hilarity. A Thanksgiving miracle? Please link up and we'll see you soon! You are once again mentioned in my TST. How many times does this make? Great story Mr. Daddy!! That poor man (boy?). How can you ever live that one down??? I'm feeling awfully sorry for poor Roper. The poor kid was in tremendous pain and y'all just laughed and laughed. And when it was obvious that he was in some serious medical crisis you continued to laugh. 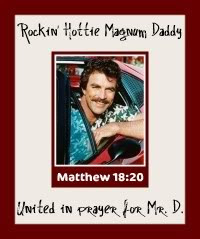 I'm a little disappointed in you Mr. Daddy. I expect you to do better next time. Poor Roper is right...that man deserves a metal after making all those guys up chuck!!! LOL. sooo funny! guess he did get back at y'all by blowing groceries everywhere. and i totally screwed up my mylinky thing upthere...arrghh! woo hoo! That was funny! "A total and complete barfarama!" Know the movie? Oh, poor guy. Was it ever decided why he passed out? Was it from pain? Oh ew! I'm glad I wasn't eating my lunch while I was reading this! if I felt decent I would so be laughing my head off at this but know i am giggling adn that is keeping my headache at bay! great story! Hey friends, I want to wish you many Thanksgiving blessings! Well, I think W.W. has a weak stomach too so I feel for that room of puking guys. ;) A couple weeks go a little girl in preschool puked up her lunch and W.W. looked and followed suit. The teacher didn't waste anytime in calling us to come get him.